California Girl is in the UK, with plans to visit Barcelona. 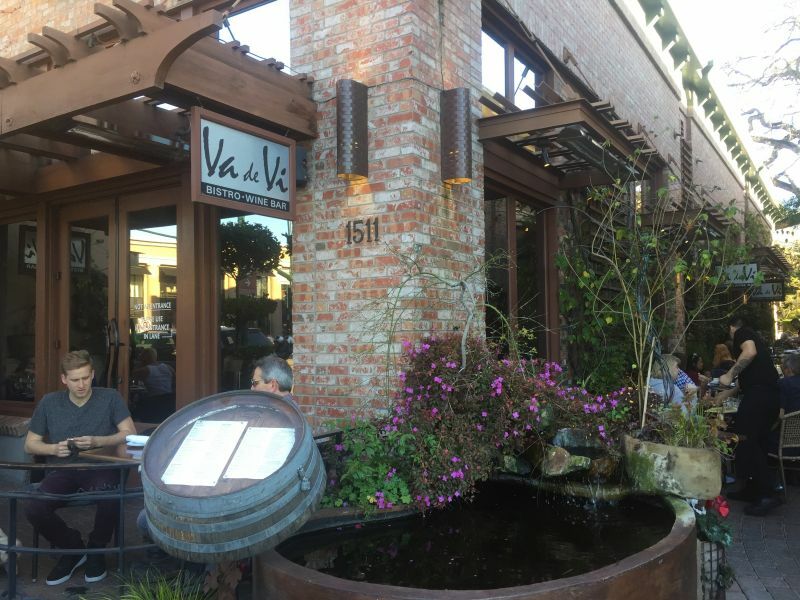 Therefore, I thought I should try Va de Vi in Walnut Creek, a bistro wine bar whose name means “It’s all about wine” in Catalan; the language native to Barcelona. The restaurant offers an eclectic menu of small plates intended for sharing. As the name suggests it also offers an extensive wine list. California Girl comments: Hmm, do I feel the least bit guilty jetting off to Spain while The Brit stays home and works? That would be a no. I am not without a heart however and plan to drink plenty of Spanish wines and Sangria for him. See how nice I am? Disclaimer: I lack both the camera equipment and more importantly the flair that enables California Girl to take great pictures of food, so these are from my phone camera. It did help that we enjoyed the warm weather and lengthened sunshine of the first day after clocks went forward. The wine list is notable for several reasons: the structure, the variety, and the pricing. 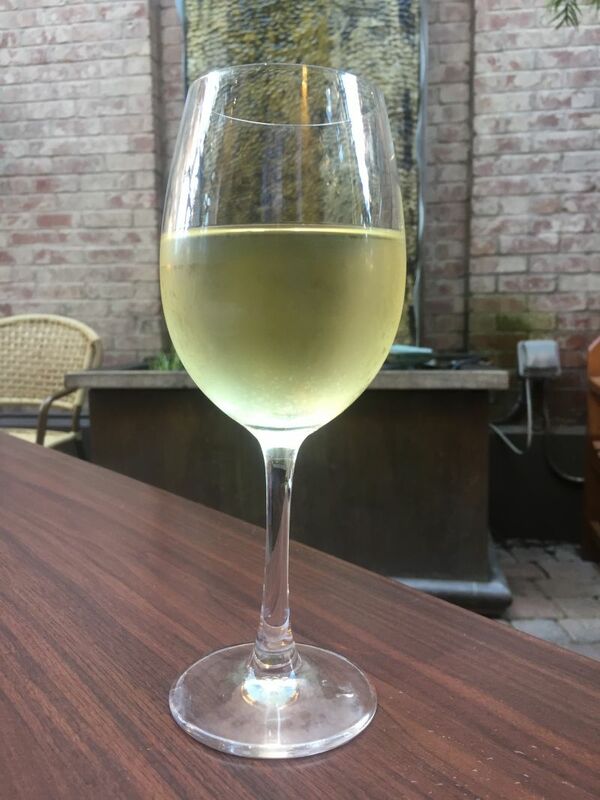 One side lists twenty-four white wines, with red wines on the flip; a total of forty-eight wines all offered by the glass or half-glass. The three-ounce pour is exactly half the cost of the six-ounce pour; so there is no penalty for those who wish to try multiple smaller tastes. The wines are then split into groups of three linked wines; with each group available as a tasting flight. The link can be style (bubbly, big cabs), or origin (Spain, Italy). The wines each come with a detailed description. This structure and information make choosing a wine from this extensive list somewhat less daunting than it might otherwise be. I started with a glass of Grüner Veltliner from Austria; a crisp white wine, with a distinct acidity. I was dining with two friends; so we ordered three starters/sides and three main dishes. Va De Vi specializes in small plates that are intended to be shared. We knew we could order more food if we were still hungry. The dishes were brought out at intervals and in an appropriate order; allowing us to fully enjoy each item. 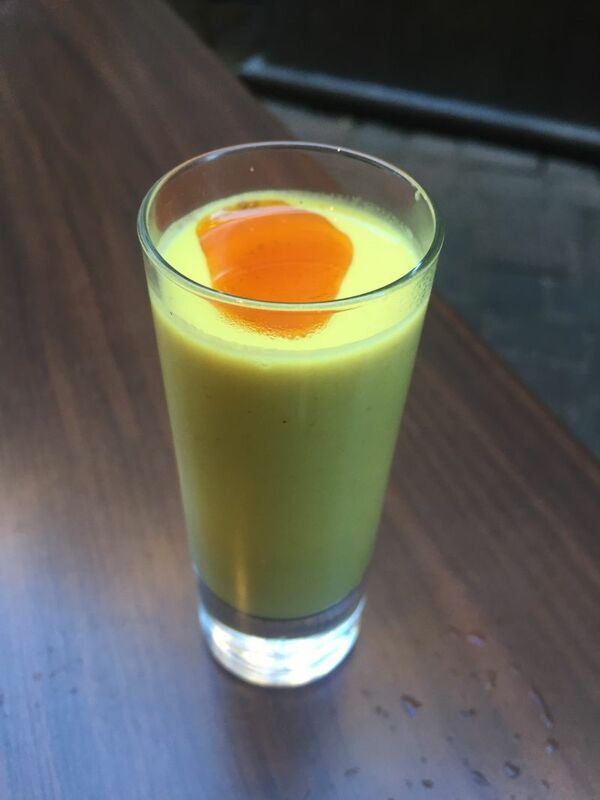 One of my friends ordered the shooter of spiced cauliflower soup. This is an ideal way to enjoy soup, in my opinion, enough to enjoy the taste, but so not much that you get bored. 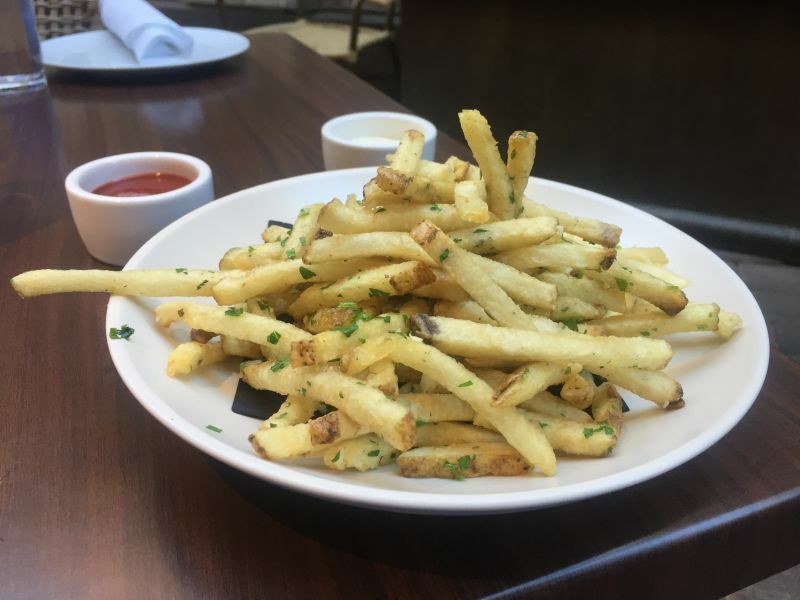 I ordered pommes frites tossed with olive oil, garlic, and parsley. These were much appreciated by everyone at the table and were picked at throughout the evening. 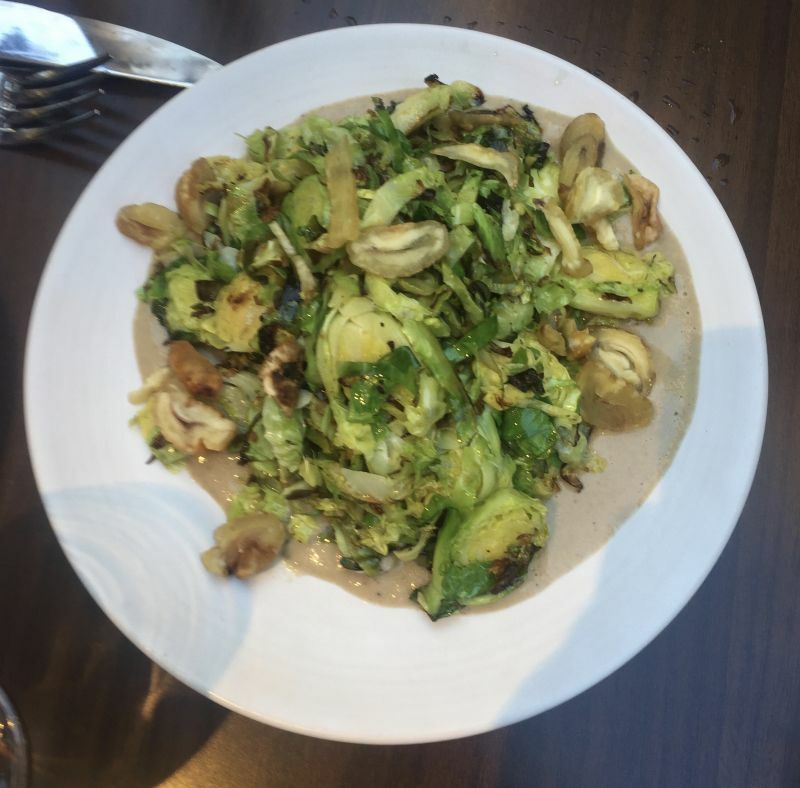 My other friend ordered the roasted Brussels sprouts that were served with chestnuts in a marsala sauce. I really do not enjoy sprouts so I cannot offer an opinion on this dish, but the feedback from my friends was definitely positive. 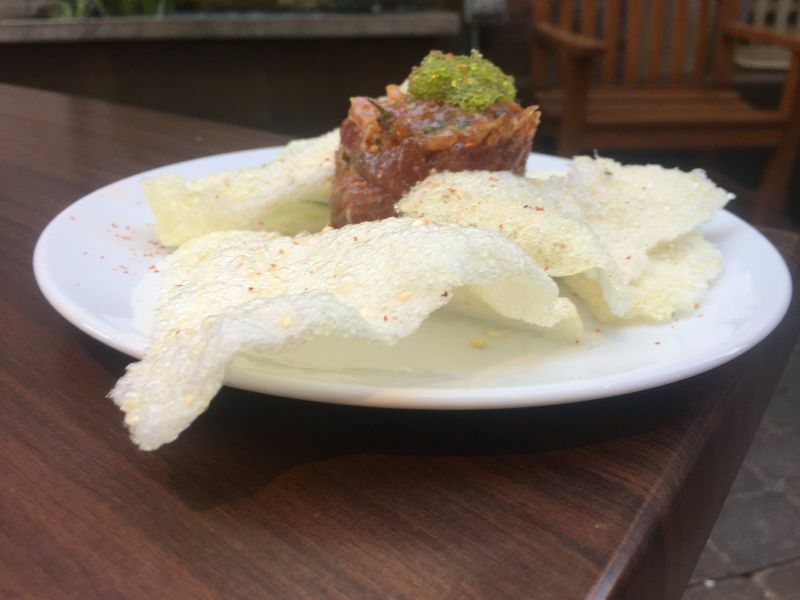 The first main course to arrive was the ahi tartare, which was served with sesame oil and soy on a set of a sesame rice crackers and topped with tobiko; a form of fish roe. The roe and spicy, as a result of being mixed with wasabi. This dish was good, but marred by the ahi being placed on slices of cucumber, which was not mentioned on the menu. Cucumber flavour permeates food with which it contacts and that was the case here; granted it was just a hint, but it is a taste that I actively dislike. 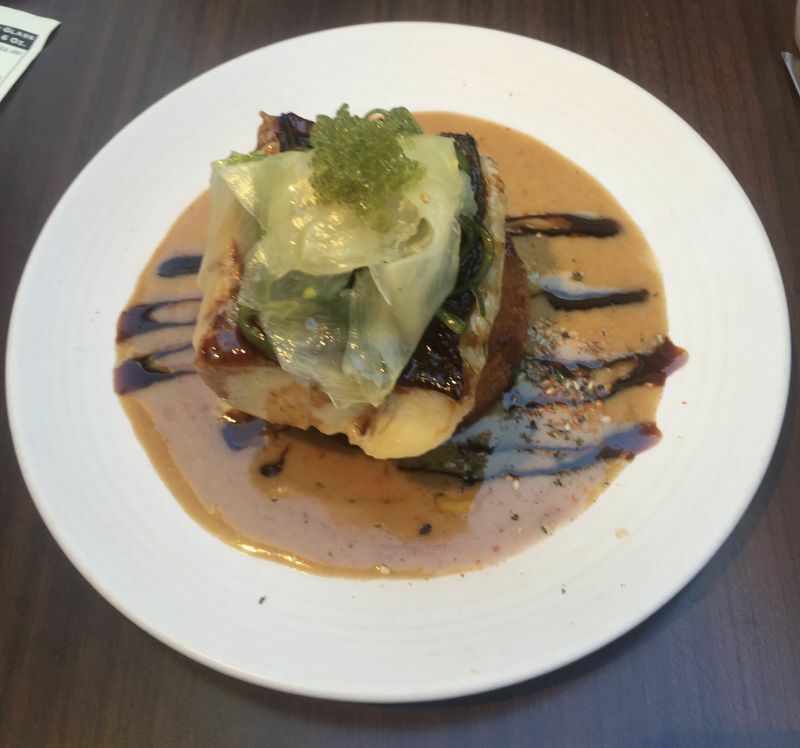 The next dish brought to the table was Alaskan black cod served on a potato cake in a wasabi butter. This was a wonderful dish; perfectly cooked fish on a tasty, texturally complex cake and with a butter that had just enough wasabi kick to lift the two main components. The fish was topped with what the menu called an ocean salad, but seemed to be seaweed and ginger – the latter not really fitting the adjective. However, the key point is that every part of the dish worked together and the overall result was better than the ahi. Our third and final entree was a braised short-rib with a mascarpone polenta and natural jus. Before this night polenta was something I found bland and unappealing. 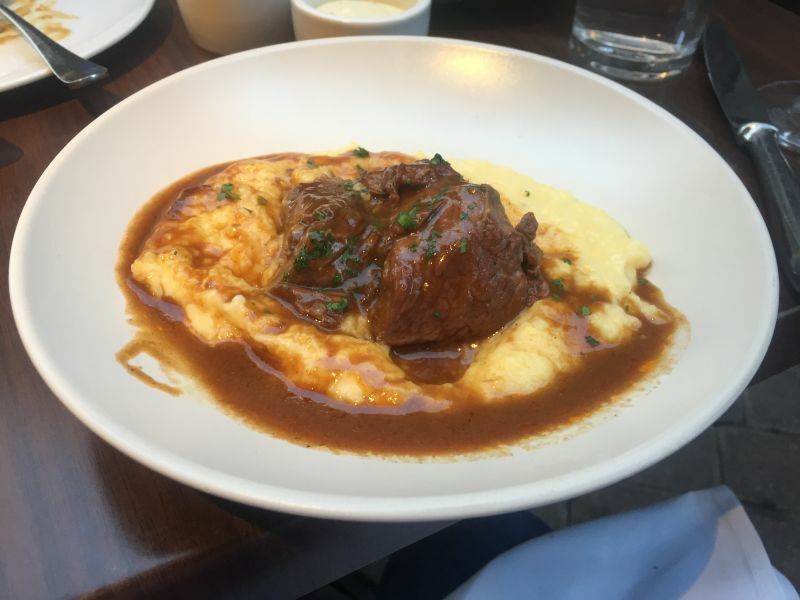 There is now an exception to that judgment; Va De Vi make a polenta that is delicious and went perfectly with the short-rib that was soft and tasty. This dish was a great pairing for my second glass of wine: a 2011 Nebbiolo from Lombardy in Italy. 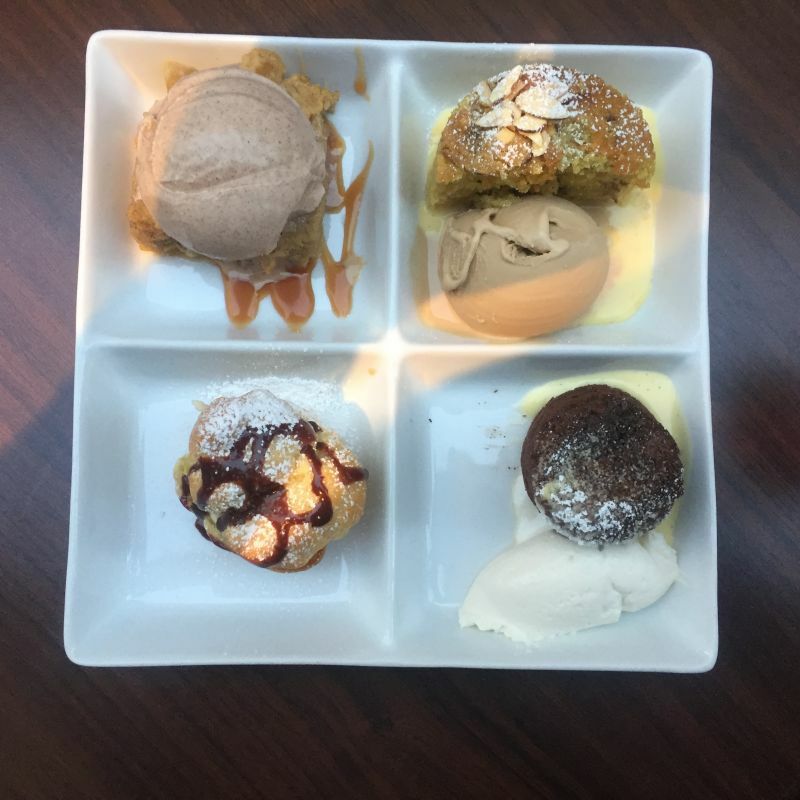 One of my dining friends, Amy, had been to Va de Vi a few weeks previously and was insistent that we order the dessert sampler. The sampler may look good, but I can assure you that it tasted even better. We were all glad that we took her advice. There were four desserts on the sampler. There was a chocolate soufflé; soft and dark, served with custard and chantilly creme. The soufflé was all this dish should be, but let down by mundane accompaniments. Next up was apple bread pudding, with cinnamon gelato, and caramel sauce. This was an all-around excellent desert; the bread pudding being light and fruity. Then there was a pastry cream profiterole; once more a fine example of this dish. Last and most certainly not least was the almond cake served with caramel balsamic gelato. If the sampler had been a 100m dash, this was Usain Bolt; a clear winner. The cake was soft with a distinct, but not overpowering almond flavour, but it was the ice-cream that lifted this dessert above the others. The acidity cut the sweetness of the cake to perfection. I would recommend the sampler plate to anyone, but I would probably order a full serving of the almond cake with that amazing gelato. The service was friendly and attentive. We sat outside on one of a handful of tables in an alley that runs alongside Va De Vi, so I can comment on the atmosphere in the restaurant. The menu is interesting, without being too fussy. Unless we were just lucky in our choices, the quality of the food and the presentation is excellent. I think the wine list alone is a reason to drop in.